Many times over the years, we've seen an interesting thing happen. Herbs that are hard to get down when one is feeling great, suddenly aren't so terrible when you really need them. Sometimes we've put together teas for friends and given them along with a warning that it will probably taste pretty bad, but should do the trick... and then, they tell us that they LOVE the taste! And so today, there was another instance of this strange occurrence, but this time, it is me experiencing the transformation of taste. This past month has held more illness for me than any 5 year period in my recollection. The final insult has been an upper respiratory thing that I probably picked up at the trade show we did. I was very good about washing hands and taking elderberry, but slacked off on the syrup when we got home. Too soon. I missed the window, and that bug caught me, but good. The air is too dry, and it's difficult to stay hydrated enough, I think. Elderberry didn't do it. Fire cider didn't do it. Eating raw garlic kept it from getting worse, but hasn't been enough to kick it to the curb (although it has kept everyone else from getting too close to me). and toward the end of simmering, mullein leaf. The contents of the strainer will be returned to the pot with the rest, and used again. I added some lemon and lime honey, the seriously thick, white dregs of the garlic honey, and a licorice root stick to stir. Not exactly my cup of tea. This is a deep, dark brew. But not only did I like it, I went back for more! I can take a few deep breaths, and that's a great improvement. I'll add more water and keep drinking this all day long. I don't know that it will *cure* this bug, but it is helping. A lot. If this thing has a hold of you, try some of these barks and roots if you have them. Some or all - or add others that make sense to you. Even hot liquids will give you some relief, and hydrate, hydrate, hydrate! While I may not teleport in my sleep anymore, I still take chamomile. Its ability to calm anxiety and soothe stomachaches can be fantastic for children as well as women during their menstrual cycle. Chamomile’s fragrance also makes it a treat to drink. The aroma of apples makes a fantastic and delicate tea, which can be perfect for children who tend to be picky eaters. Because chamomile is antioxidant, antimicrobial, antiplatelet, anti-inflammatory, antispasmodic, and anxiolytic, it is able to aid in a number of ailments. While we all know to drink it before bed it can be used for less common ailments such as blemishes or hemorrhoids. My favorite use for it, however, is for PMS. Chamomile can be used as a diuretic if brewed in a decoction according to Modern Botanical. It also helps with any feelings of moodiness or frustration since it can soothe an anxious mind. 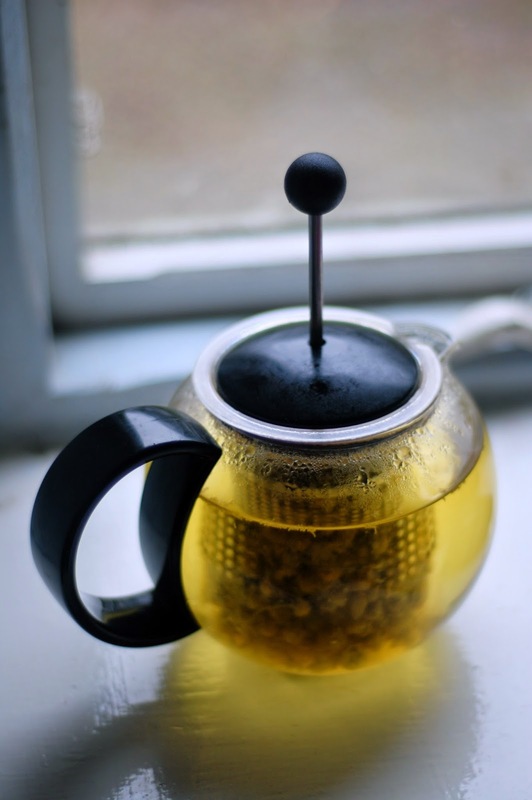 As if it wasn’t enough, chamomile is also an antispasmodic, which makes it perfect to drink for cramps. So while your office is filled to the brim with paperwork or your children have to go to four different games this afternoon take a second to brew yourself some chamomile tea! add a touch of honey if child is over 2 years of age, sugar if younger. Lemon is a nice addition. 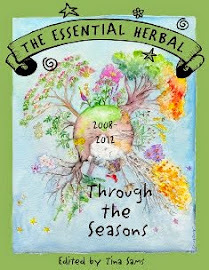 Working with herbs is a wonderful experience that continually gives me knowledge and inspiration. Learning from others, reading, researching, and creating offers an endless amount of information to me. 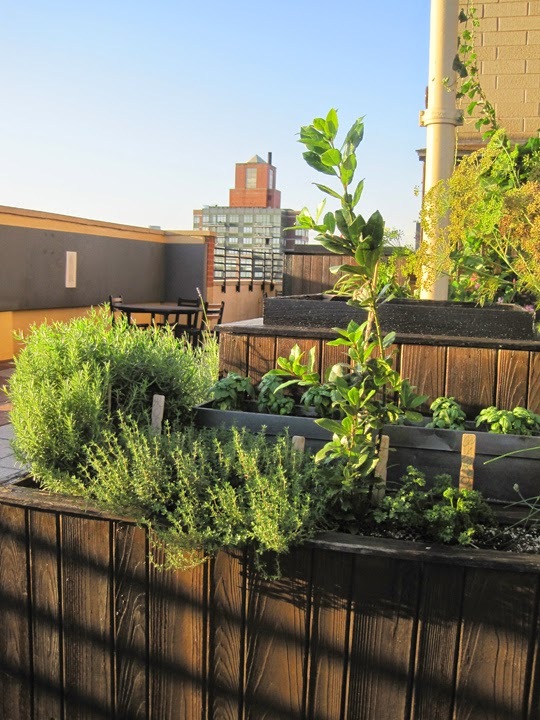 A rooftop garden in Manhattan, with Rosemary, Thyme, Basil, Bay, and other herbs. As mentioned before, interning at The Rosemary House has been an amazing opportunity that has given me different perspectives on plants, medicine, and the earth itself. Susanna answers any and all of my bizarre and sometimes random questions as we work on teas, mixes, and a million other things. Every day she amazes me with her ability to be an endless fountain of knowledge. Much like my mother and aunt, Susanna inspires me to continue my studies and shows me that there is always something new to learn. Being there I have, of course, heard a lot about Rosemary. Early spring Rosemary, Chamomile, and Chives greening up. Rosemary is a clarifying herb, which is great in shampoo and soap. The herb is also incredibly aromatic so your hair smells wonderful throughout the day. Because of its aroma many brides in the medieval period (even royalty) wore wreaths dipped in scented water to their weddings. These wreaths represented fidelity, love, and remembrance. It was also worn to funerals. Since it has a strong fragrance, rosemary was used to keep the room fresh. Many funeral goers would wear it on their person since rosemary is known for remembrance. Often wearing sprigs on their clothes or giving some to the deceased, they hoped their loved ones would know they would never be forgotten. We have about a 60% chance of Rosemary making it through the winter here. Zone 6b. Even scholars used rosemary for memory. In ancient Greece many students would bring sprigs of rosemary to class and sniff while they studied. Many students today will even bring some in during finals week or rub their pencil with rosemary oil while studying and during a test to retain information. This tonic, astringent, and diaphoretic herb has been used for hundreds of years to help retain memory, clean and clarify, and has even been used as a nervine. The calming affects of smelling the plant may help some focus and retain memories such as lessons. So before your next exam, presentation, or just to remember to pick up the milk don’t forget the rosemary! Molly took the orders out to the mailbox this morning as she and Maryanne headed out on deliveries. Later I noticed a couple of things she missed, and grabbed the camera before taking them out. The weather has been obnoxious here, as it has been all over the US, but from my perch looking out the window, I could see iced droplets hanging on everything. Makes for some beautiful sights in the middle of winter. And I just noticed that this is our 1000th blog post! I'm going to share this post several places. Comment on it, and I'll choose someone to get a free pdf subscription on Wednesday! **** our winner is Tj Holley**** Thanks for playing, everyone! The Juniper berries that are so easily visible in summer are nearly hidden in their icy cases. Although we've gone way below freezing for several days and nights running, the Chickweed beneath some of the evergreens is still cheerful and vibrant. The Concolor Fir (aka White Fir) out back stands silently watching over the fields ensconced in a shimmering gown of crystalline ice. To those of us living here, this tree is very special. Our mother (and grandmother) loved it, and it is where we go to talk to her. It holds its own universe inside, with many bird families in the boughs, and I suspect an occasional skunk beneath them. One winter night during a full moon, I saw a great horned owl perched on the uppermost part of the tree with the glowing round moon as her backdrop. A piece of garden decor stands as a protector for a small Fig tree in our new fruit tree orchard. It kept the mower and weed whacker away, but I noticed today that it did not do the same for whatever nibbled the top of the fig branches. I learned last year that it will survive, growing up from the roots (as my completely banded 6 year old fig tree did last year). We had an enormous Fennel return last year - not bronze either - Florence! I gathered about 1/2 the seeds this year, but left plenty behind. Maryanne makes a great salad using fennel and oranges. All of the leaves on the Holly bush are sheeted with ice. Parsley umbel under ice. This is another plant that I'd love to see reseeding as well as the Fennel. We use a lot of parsley here. It grows near the Cilantro and Borage, and they have all the room they need to stretch out and multiply. A beautiful, mature White Pine serves as a windbreak on the side of the house. When my sister and her husband bought this farm, nearly all of the trees were White Pines, but there are few of them now as tastes have changed, and people prefer Balsam Firs, Concolor Firs, and Scots Pines. They are all wonderful, but I'm happy to have this one nearby. 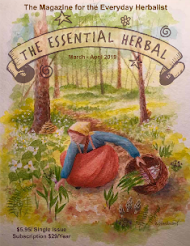 With half (or more) of the US dipping into very cold temperatures, we thought we'd share a little memory of warm weather with you, via the PDF of our Jul/Aug '14 issue of the print magazine, The Essential Herbal. If you enjoy it, we publish every 2 months, and you can order a subscription on our website. If you really like it, we have two 5 year compilation sets (we're in the 14th year now). If you LOVE it, you can pick up all 10 years in book form at a pretty good price. When we compile the magazines into books, we separate the articles into chapters. We pull the recipes and remedies from the text of the articles, and put them into chapters that you'll just love wandering through. We do exhaustive indexes. It's like getting 7 or 8 books in one! We've got all kinds of great herbal things on our site. So sit back, make a cup of tea, read the magazine, and forget about that nasty weather for a little while. Think summer! During my time as a Homestead Herbalism student my favorite experience was watching my classmates fall in love with herbs. While I have experienced it, (Heaven knows how many times now) watching someone see a specific plant in a whole new light just motivated me to learn more. One story that sticks in my mind is that of my classmate, Rachel. Rachel has a passion for the earth that was apparent during our first day of class. Her commitment to sustainable landscape and farming practices was always fascinating to me and watching her knowledge of herbs grow was utterly inspiring. So when she decided to focus on agrimony as her final project I was sure I was going to learn more about this plant than I ever expected. Agrimony is native to the U.K. and is part of the rose family. It has bright yellow flowers that along with other aerial parts can be used teas, tinctures, and elixirs. 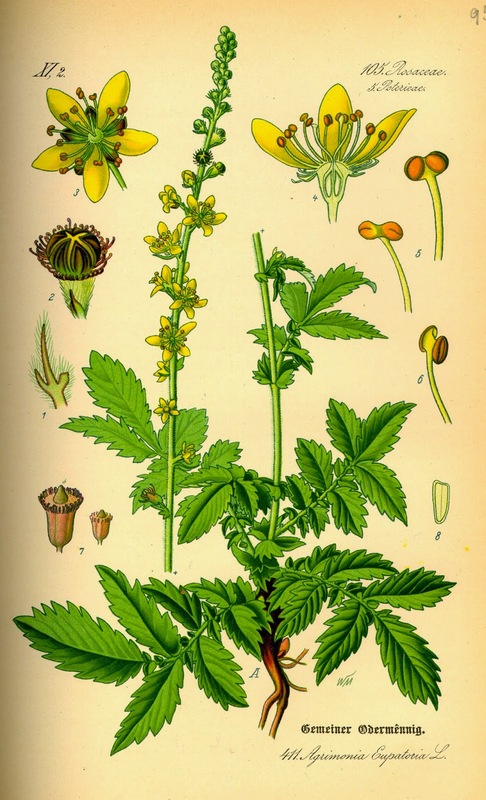 In France agrimony is commonly used to bring a delicate and citrusy taste to teas. It was known as a “spring drink” or “diet drink” and was used as a blood purifier after a long winter. 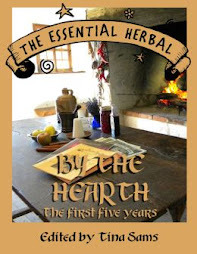 Rachel stated in her final project that agrimony was often used in l’eau de arquebusade which is an herbal tonic containing many different herb essences. Used to wash wounds and help skin issues, l’eau de arquebusade is still used by those with acne, psoriasis, and eczema. Agrimony and my classmate’s adoration for the plant truly encompass what makes the study of herbs so great. All plants have a way of helping humans, even if we don’t realize we need it. Agrimony has a long list of benefits varying from skin relief to mood stabilizers. If one plant can offer so much to humanity, imagine what the rest of the herb world has to offer? We've got another book coming out in March, and you can sign up now to be one of the first to get it! By doing so, you'll get a signed copy and your choice of one of our smaller books (listed below). You won't want to pass this book up. 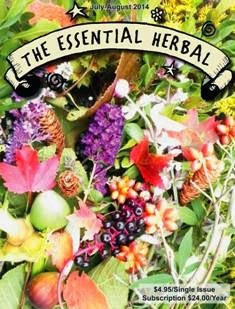 Healing Herbs discusses 20 of the most useful, common, easily obtained plants for use in medicine and/or as food. 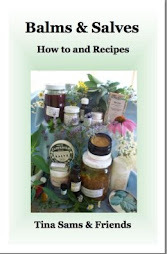 Each chapter also includes the favorite recipe or remedy from a contributing herbalist. 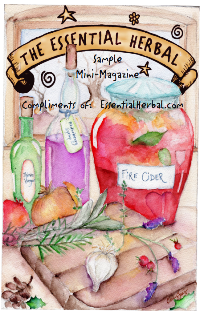 If you're an Essential Herbal reader, I'm sure you'll recognize some familiar names! From plantain to chickweed, garlic to violet, you'll find some of these plants just by walking out the door. 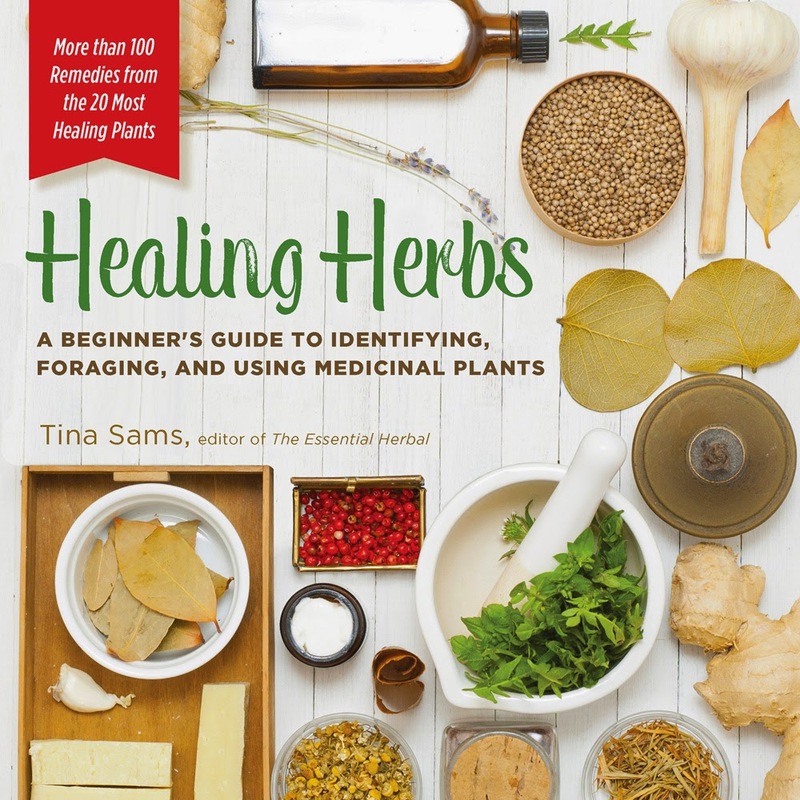 You'll learn how to make medicinal preparations and how to use them, as well as whipping up some tasty dishes! Shipping will be $5.00 (US - outside US shipping will be determined when we have the book in our hands), but the book of your choice will offset that cost. Please make note of your choice in the "comments" section upon checkout. Note - These will be signed copies. You can also pre-purchase the books directly from the publisher. If you're a business interested in wholesale, please contact Fair Winds Press! It has been a while since a book came along that combined so many of my favorite things. 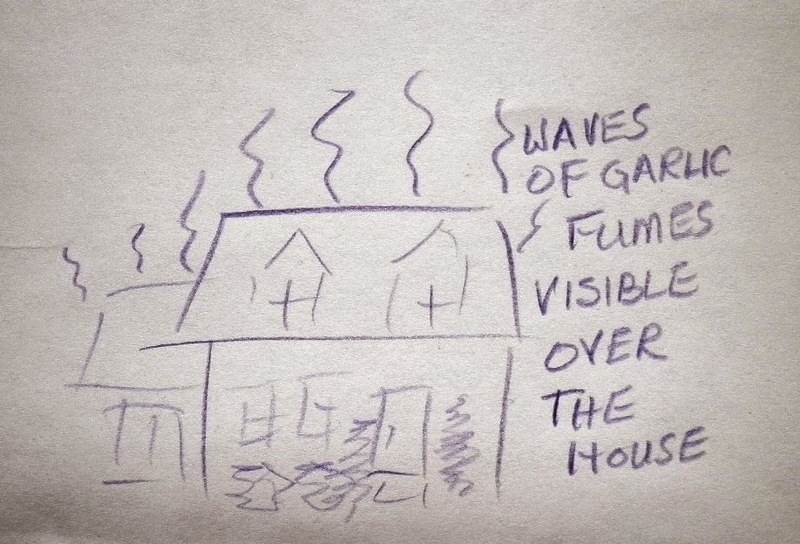 This was written by Nick Neddo, who teaches wilderness survival and living skills along with drawing at ROOTS School in Vermont (www.nickneddo.com for his artwork). He did a fantastic job of explaining and illustrating the hows and whys of the various projects in the book, and managed to instill a real excitement for making almost all of them. Although there are a couple different sized kilns here on the farm, his description of the process of making charcoal for drawing makes me want to build a fire and make it his way. In any case, I think this book will be very popular among our readers, with good reason. It's so well done, and written very purely, in close touch with the earth. It's kind of a love story, because you can feel how appreciated all of the earth's offerings are to the artist. The writer/artist did many of the illustrations inside, using charcoal, ink, or pigment made from the subject of the illustration. For instance, a depiction called Oak and Acorn is done in acorn ink. A panel of different berries are all drawn with ink from the individual berries. Amazing! The book is $24.99 and is available from www.quarrybooks.com. It may also be available from the writer at the website above, but it is brand new, due to release this month, so I'm not sure about that.